A publication of the National Resource Defense Council (NRDC) arrived recently. In its spring 2014 edition of “On Earth” is an article about Kabira Stokes and her company, Isadore Recycling. What does this article have to do with belief in a hell and it‘s creator? You may be surprised. Given the personal reports by ex-cons in the article of not being able to be employed because of bias against them by potential employers, one might conclude that the unspoken message to them is to return to the only option open to them and which put them in prison in the ﬁrst place: a life of crime. By giving them employment, Kabira Stokes offers them opportunity not only for future employment, but experience, security, and chances to prove their trustworthiness. Her whole philosophy of what is just and not, her moral compass makes sense. 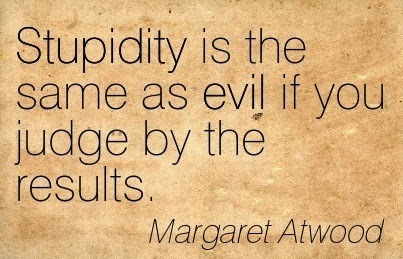 Some years ago, I read a comment by a man who said that evil equals stupidity. It was the kind of remark I envy others for making; the kind of a remark that creates a nagging itch over the years to ﬁnd examples for it. I keep ﬁnding many. For example, ordinary people will kill a spouse or parent for insurance money and/or to be with a lover in the expectation of never being found out and caught. They end up incarcerated for life, losing everything; money, lover, children, even their own lives. Or a robbery of, say, 500 dollars, that ends up with the perpetrator spending ﬁve years in jail. Let's see, that‘s at a cost of 100 dollars per year, not counting incarceration. That's stupid (evil), too. What about invading a country to overthrow a dictator, and thereby killing more of its citizens than the dictator did, or bombing cities under the control of dictatorships and killing innocent men, women, and children there? Those are really evil (stupid) decisions. And what about the fabricated story of the decision of someone to drown millions of families just because some of their members didn't please him? And saying, after doing so, that it was all a mistake because humans weren’t going to change their ways anyhow? What a stupid and evil, genocidal, decision-maker. People who [...] believe [...] their child's winning a football game are a blessing from a benevolent father-ﬁgure, who at the same time, watches infants and children die by the thousands every day [...] That's stupid!Isn't it stupid to punish children for the crimes their parents commit, as if they won't suffer enough when the parents are caught and the kids are left parent-less? And punishing their children's children, also? Really, that’s non-productive, wasteful, stupid, and evil. And creating a place of non-ending punishment for mistakes? What the hell's the point of it? That's a solution? Justice is one thing, but vengeance on that scale is just plain evil-stupid, accomplishing nothing. Talk about stupid decisions and methods: consider anyone allowing, for centuries, people supposedly designated to represent him, to contradict one another about his laws for living, without intervening and clarifying those laws. Consider that same person allowing a pope to condemn curiosity as morally wrong. Curiosity about everything is the only method that works to understand reality, to make life better and advance human rights! It's just plain stupid, counter-productive and a waste of good mind-power to not promote it. The repressions of curiosity are harmful to societies, to the point of where individuals and societies sometimes erupt in murdering one another: a stupid (evil) policy. Propagating the mixed messages that say one must strive to attain an inner union with a deity, i.e., one's ego-imagination, while at the same time condemning self-centeredness, is a puerile, stupid, mind- game, as is playing head trips on trusting gullible minds. Can one think of any other games more stupid than that? (Perhaps the childish game of wishing the worst torments on those who offend you via the worst imaginings a child can come up with: ﬁre, drowning, torture?) Vicious or stupid - the results are the same. The god which preachers preach is the god of scriptures - the god who brings the death of any hope of perpetuating oneself through one's progeny, by destroying them. And hell is utter hopelessness. In the Divine Masterplan, all explanations for injustice and tragedy are supposed to be given after the person is dead! Such a stupid idea. Kabira Stokes is my heroine, and a clear choice over a god as deﬁned by the three Abrahamic religions, and you can see why. From a purely rational point of view, what she represents makes sense. The alternatives of the god mentioned are stupid-evil wastes of lives, talent and potential, without hope. Maybe the believers in that god should think about these things. Should crosses be imprinted with the words, “I'm with Stupid(ity)”?